Most people would either laugh or be in awe after seeing my current brewing set up. 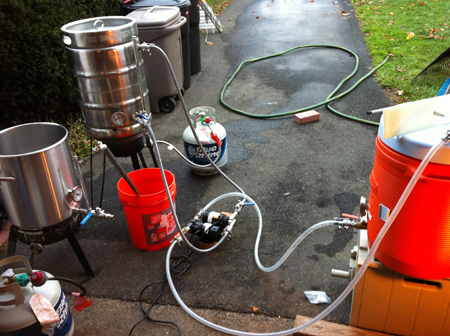 I got pumps, shiny keggle mash tun and boil kettle, cool stainless steel disconnects, but what I don’t have is a stand to brew on. If you come over while I’m brewing you’ll see hoses running everywhere, pumps mounted to a 2×4 with switches just laying on the floor, pieces of steel laid across my burners so the keggles don’t fall off. Just look at the photo, it is quite a sight. But folks, that is all about to change. Over the last two weeks I’ve been emailing with Kurt over at BrewSteel.com, to designing a rig for me. It was extremely hard for me to find a place to build a single tier stand for me. 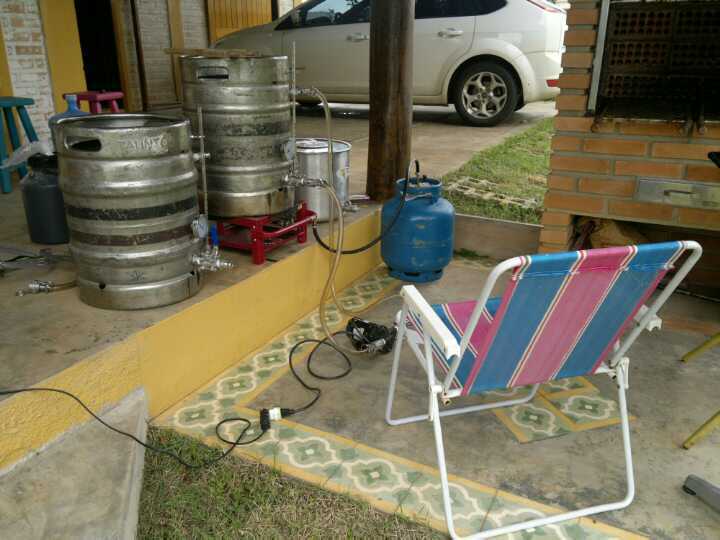 I did lots of trolling through the homebrewing forums looking for companies that specialized in welding and assembling homebrewing stands. As my search through the forums a couple of names kept popping up, but the only stands that continued to come up with rave reviews were the Badass Brewstands. One of my issues, I hate paying a ton of money for a stand when I know I could probably build it… if I knew how to weld. I like to build my equipment, I only want the frame with all the welding done, burner mounts, pump mounts, all that jazz. However I have super high standards. If I’m paying someone to do a job, it better be done with expertise and done right so that it will last. We all know you get what you pay for, I think that holds true for all skilled craftsman jobs, brewstands included. 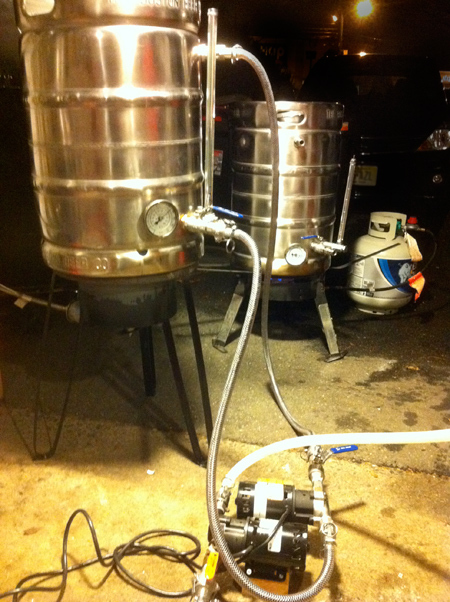 After many emails with Kurt at BrewSteel, him asking me how I brewed, me asking him about this nuance and that, how the process worked to get the rig built, and how he worked, we had a brewstand designed for me. It actually happens to be a bit like what goes on the Basic Single Tier Brew Stand. I went with a very basic stand so I could continue building/adding on to the rig as I it suits my needs. Kurt has been very accommodating to my requests and working with me to build what I need, not what he can up sell me on. According to Kurt, each stand is custom built for the individual based on their needs and how they brew, not to mention will send pictures as the build progresses. While it has only been a couple days since I sent in my deposit, I’m as gitty & excited as a six year old at Christmas! 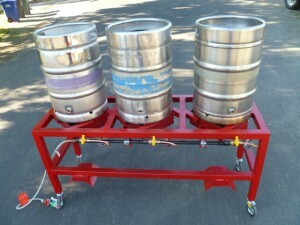 The beer stand looks nice, but I love the look of seeing the equipment all over the place. It looks so impressive like that, makes it look like you are a serious brewer. I am in the process of getting all my full grain equipment, hopefully in the next few months I will have a setup almost as nice as that. when is the stand supposed to be ready? Is there a pic posted somewhere that I am missing? Hi Eric, No pictures yet. It is being built. AS I get photos of the build I will post them. Good luck with your all grain set up, are you going with coolers or kettles? Just have a similar setup to your until I have my brewstand built as well. The lawn chair was my in laws contribution to my home brewing. Or pay back to all the bottles of my homebrew I gave him. I really need to get my act together and get a new brewing stand. Current one just doesn’t look as cool as those others are rockin. I’m stoked it is only a couple weeks away! I should be brewing on it by April. Previous story No Guinness I Will Not Verify My Age!